Ines Kowalyszyn is an equal opportunity artist; any subject is fair game for her artistic sensibility. 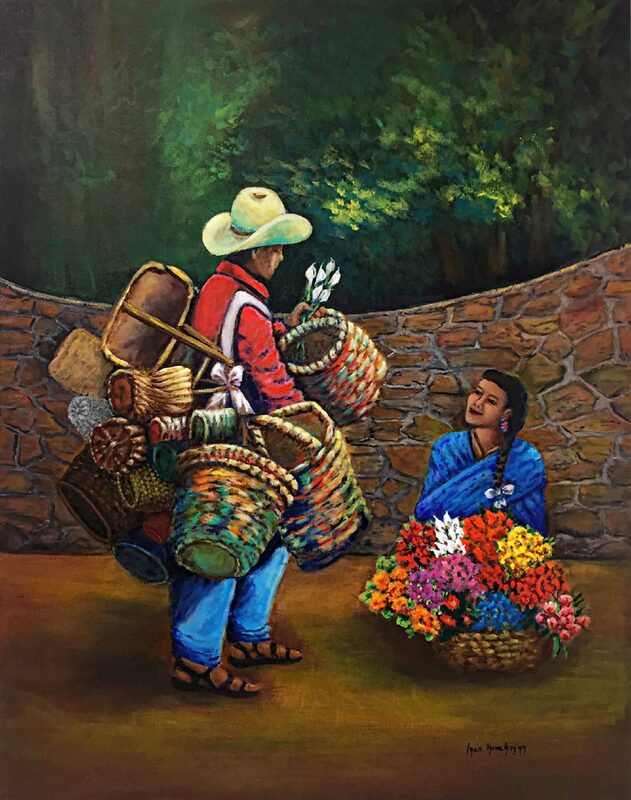 Her exhibition, “Hundred Shades of Passion,” at the Dustin M. Sekula Memorial Library offers an array of her representational acrylic paintings. Primarily involved with commissioned work, Kowalyszyn’s skills have been honed to rise to the expectations of her collectors. She follows a similar non sequitur pattern with her own work. This approach sets her apart from many other exhibiting artists. Rather than creating a related series from an idea, or even forming a loyalty with a single category, such as nature, still life, the human figure, etc., Kowalyszyn plays the field. Her choice of subjects cuts a broad swath. “I would get bored repeating something,” she confessed, expressing an interest in just about everything. Possibly her inclination toward diversity in her art is a direct reflection of her practice of creating art works for others on commission. The challenge in commissioned art is always to rise to the expectation of the client by producing the best possible solution to the assignment. Each commission can become a fresh experience of observation of object, color, tonal contrast and spatial organization, and this routine seems to have carried over into her personal work. 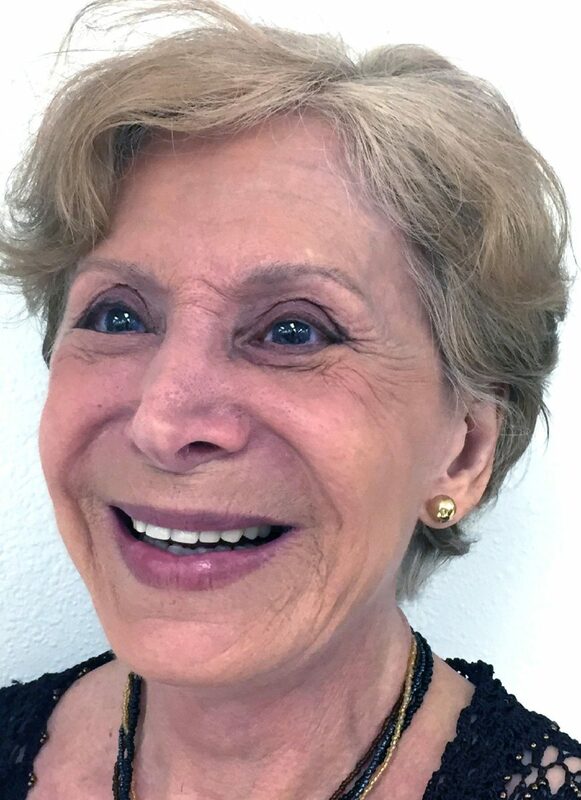 When Kowalyszyn has an idea or sees something that interests her, she becomes her own client, moving from subject to subject and satisfying her own expectations. This is the second exhibition we’ve seen from this artist, and like her earlier show, paintings reflect stylistic contrasts. 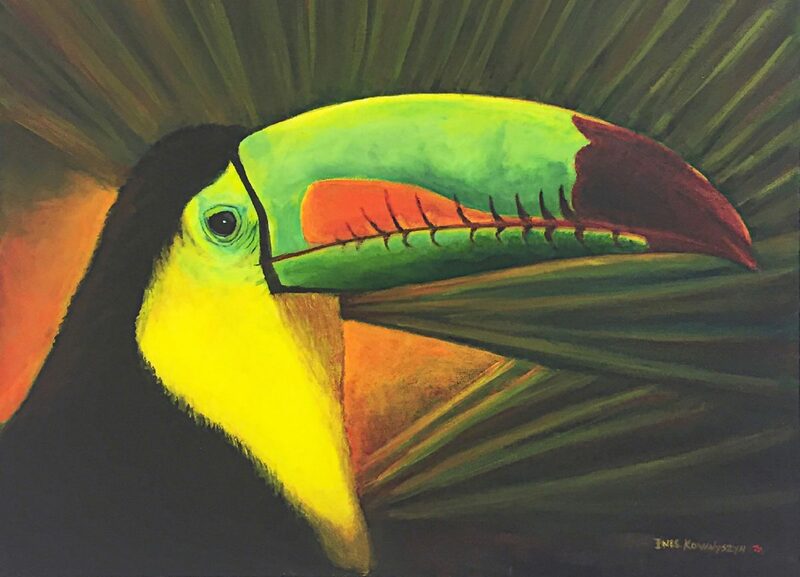 Hanging next to a realistic acrylic of a large-billed toucan, is “Horse’s Head,” a visual fantasy. 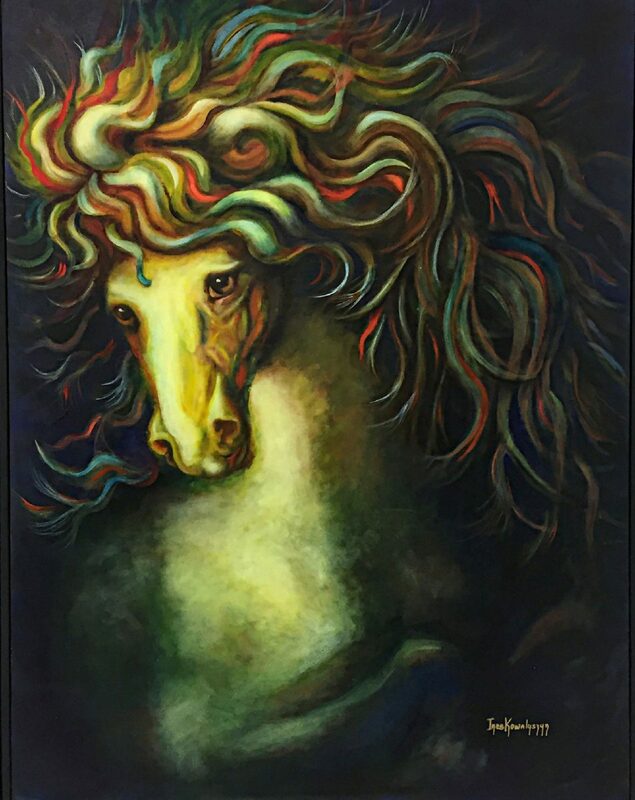 Although the horse’s multicolored mane would send shots of excitement through any hair salon owner, the artist confessed that she is actually fascinated with eyes, and beneath the carousel-flavored mane, the animal’s eyes glow with a reflective treatment. 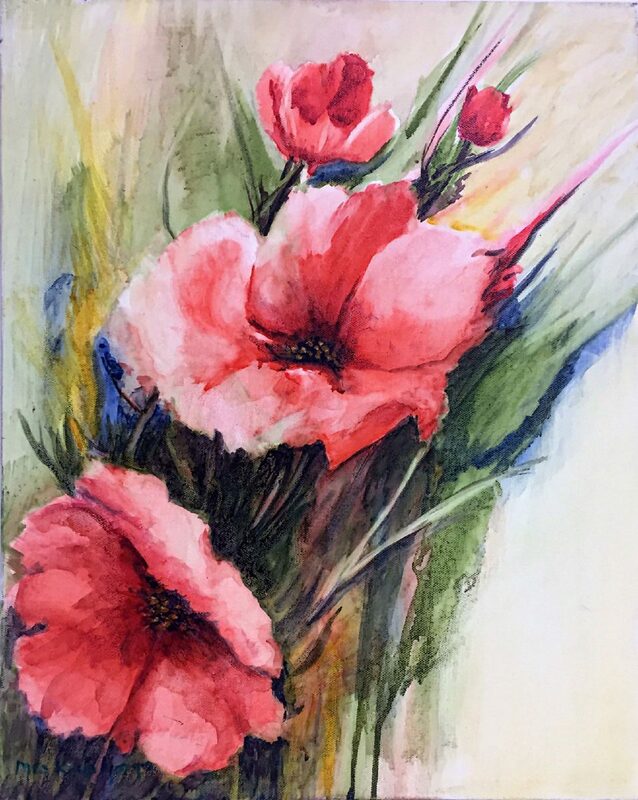 Other interesting contrasts of stylistic approaches include the paintings, “Flowers” and “Faroles.” The gently flowing colorations and organic edges in “Flowers” informed by a watercolor technique depicts the natural softness of the coral colored flowers. 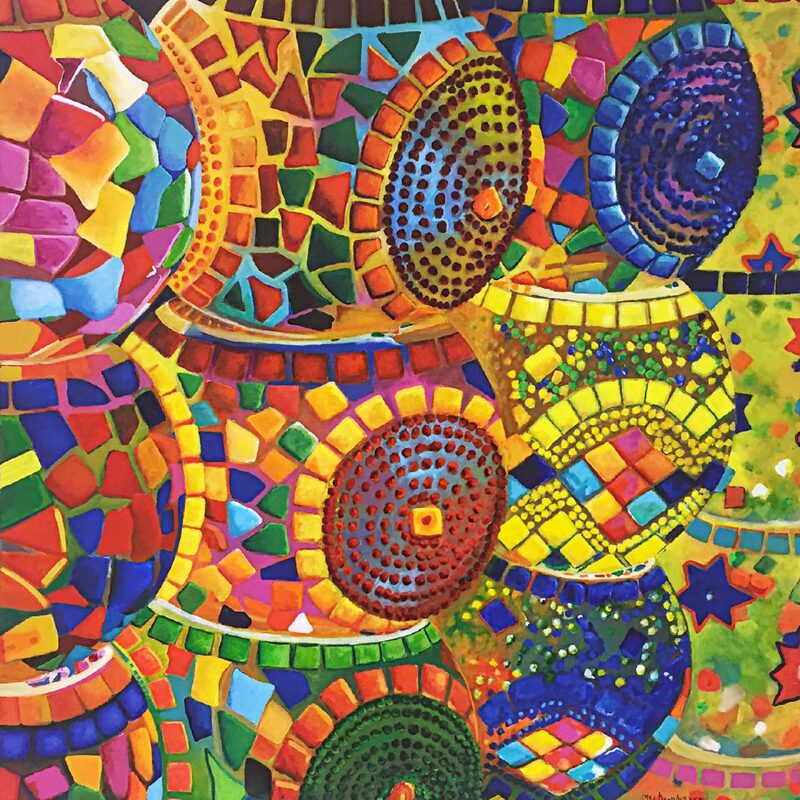 “Faroles,” or lanterns, is a hard-edge exultation of color, bordering on abstraction with its repeated geometrically-shaped mosaic tiles and intense color-contrasting circles. The unifying quality in this exhibition is Kowalyszyn’s love of color. Color contrasts occur throughout the show — warm against cool, dark against light, and saturated against neutral. Dark or neutralized backgrounds often allow saturated subjects to pop out. 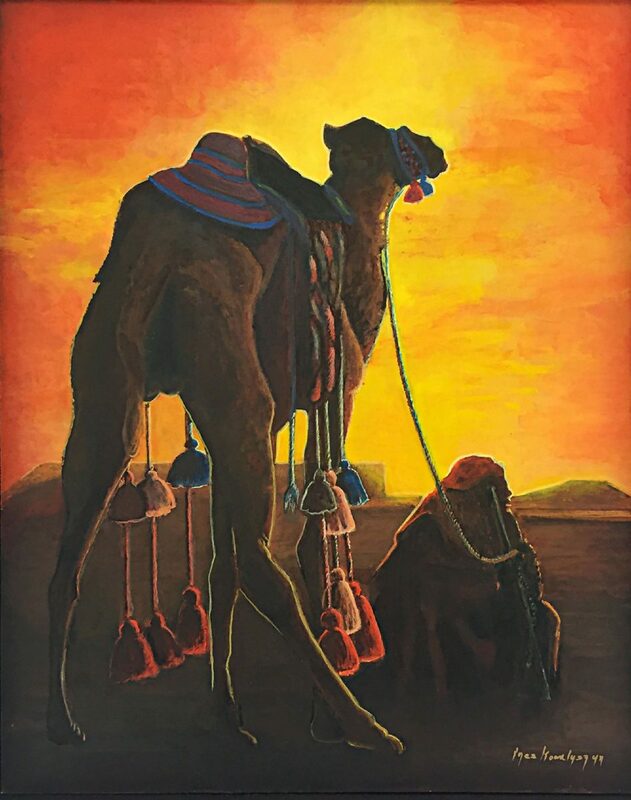 Paintings such as “Faroles” are dominated by a strong use of reds, yellows, blues and greens, while other paintings utilize quiet neutral tones to enhance the illusion of pictorial space. In “Toucan” and “Baskets and Flowers,” neutralized background hues allow bright blues, yellows and reds on the foreground subjects to command our full attention. “Far Away” turns the illusionary tables by placing dark, color-drained figures against the backdrop of a blazing yellow and orange sky as the relentless heat of the desert merges with the approach of night. “Hundred Shades of Passion” is a celebration of subjects that speak of the artist’s interests in this family friendly exhibition. Hours: 8 a.m. to 9 p.m. Monday to Thursday; 8 a.m. to 5 p.m. Friday; 11 a.m. to 3 p.m. Saturday; 1 to 5 p.m. Sunday.